Title: Can Democracy Survive Global Capitalism? One of our leading social critics recounts capitalism’s finest hour, and shows us how we might achieve it once again. In the past few decades, the wages of most workers have stagnated, even as productivity increased. Social supports have been cut, while corporations have achieved record profits. Downward mobility has produced political backlash. What is going on? 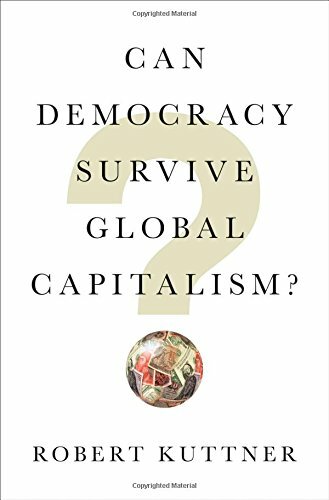 Can Democracy Survive Global Capitalism? argues that neither trade nor immigration nor technological change is responsible for the harm to workers’ prospects. According to Robert Kuttner, global capitalism is to blame. By limiting workers’ rights, liberating bankers, allowing corporations to evade taxation, and preventing nations from assuring economic security, raw capitalism strikes at the very foundation of a healthy democracy. The resurgence of predatory capitalism was not inevitable. After the Great Depression, the U.S. government harnessed capitalism to democracy. Under Roosevelt’s New Deal, labor unions were legalized, and capital regulated. Well into the 1950s and ’60s, the Western world combined a thriving economy with a secure and growing middle class. Beginning in the 1970s, as deregulated capitalism regained the upper hand, elites began to dominate politics once again; policy reversals followed. The inequality and instability that ensued would eventually, in 2016, cause disillusioned voters to support far-right faux populism. Is today’s poisonous alliance of reckless finance and ultranationalism inevitable? Or can we find the political will to make capitalism serve democracy, and not the other way around? Charting a plan for bold action based on political precedent, Can Democracy Survive Global Capitalism? is essential reading for anyone eager to reverse the decline of democracy in the West.